So what’s the difference between Cha Gio and Lumpiang Shanghai (Filipino egg roll)? Both have vegetables and meat, the kind may vary depending on who is cooking. There's a slight difference in size --- Cha Gio is bigger than Lumpiang Shanghai. The big difference for me is the inclusion of vermicelli noodles in Cha Gio, and Cha Gio is often served with lettuce leaves and slices of fresh cucumbers and other garnish like fresh cilantro and basil leaves. I omitted that part last night but I included it here. Let me share with you the recipe. My family loved it…maybe yours will love it too! Prep Time: ~1hour Cook Time: 10 mins. Yield ~32 pcs. 1. Soak noodles in hot water for 10 minutes or until soft. Drain. Cut into 2-inch length. Set aside. 2. In a pan over medium heat, sauté garlic in olive oil until light brown. Add onions and sauté until almost translucent. Add meat. Sprinkle with salt and pepper and stir-fry until brown. 3. 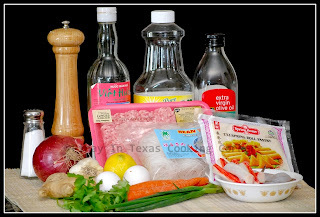 Add noodles, carrots, cabbage, green onions, cilantro, ginger, soy sauce and fish sauce. Mix well and cook for 3 minutes. 4. Add shrimps and crab meat. Cook until shrimps turn to light pink. Add eggs. Add salt if necessary. Remove from heat and cool completely. Drain if necessary. Set the sauce aside. 5. Prepare the wrappers. Spoon 2 Tbsp mixture on the lower edge of each wrapper leaving 1 inch edge. Begin to fold egg roll like an envelope: first, fold over the lower 1 inch edge over the filing, then the left edge, then the right edge, then roll up to the top edge. To seal the wrapper just moisten the top edge with water. I used the sauce I got from draining the cooked mixture. Place the wrapped egg roll on a platter. 6. Heat the oil in a large, deep frying pan over medium high heat. Place egg roll one at a time into hot oil, with the seam down (this will keep it from unraveling) and then quickly turn the egg roll to ensure the skin crisp up and does not stick to other egg rolls in the pan. Adjust heat so that the oil is bubbling gently and not too vigorously around the egg rolls. Each egg roll will take about 5 minutes to cook. Shake the egg roll over the pan to help remove the excess oil. 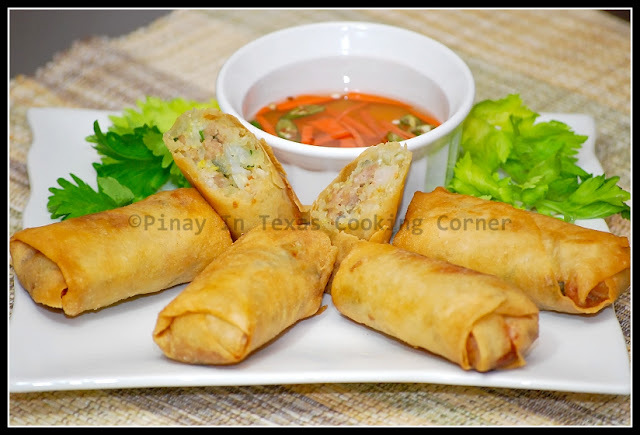 Place egg roll on layers of paper towels to drain. 7. Next, make the sweet fish sauce for dipping. Place garlic and thai pepper into a small bowl then add the rest of the ingredients for the dressing. Stir well until sugar dissolves. Adjust the sweetness or sourness to suit your taste by adding more sugar or lemon extract. 9. Serve egg rolls with the dipping sauce and lettuce wrap fixings. Enjoy! Note: The Cha Gio recipes I found didn't call for cooking the filling, but I did. I just prefer cooked filling just like with Filipino egg rolls and siopao.